When we moved into R.E.D. by the Sea a little over a year ago, we felt she was perfect just as she was. The previous owner had presented the space is such a charming manner …painted white throughout…allowing her things to speak. We fell in love with the simplicity. The home inspection confirmed a solid envelope. Little things needed correcting he said but these we could easily do ourselves. 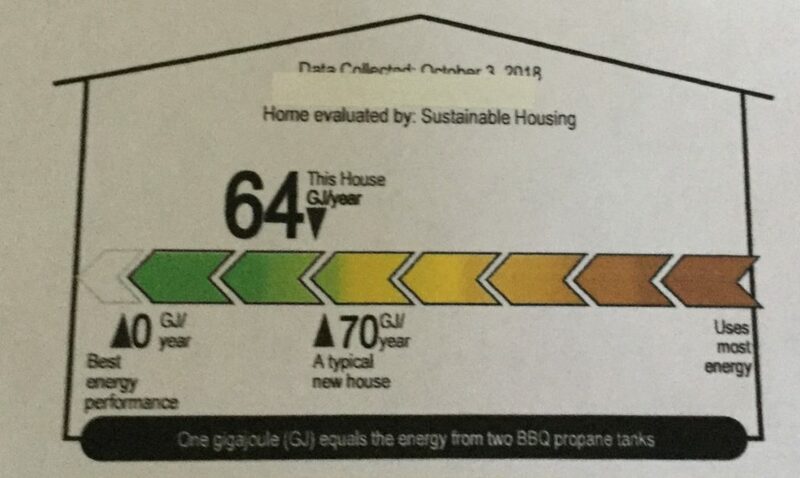 Energy tests showed that we were a few points more efficient than a new build…surprising for our eighty-eight year-old gal. The roof we knew would have to be replaced in a few years but being a vital part of a secure envelope and with the couple of nor’easters we had last year, we decided not to wait, so a new metal roof is in place that will last well beyond our life-time. 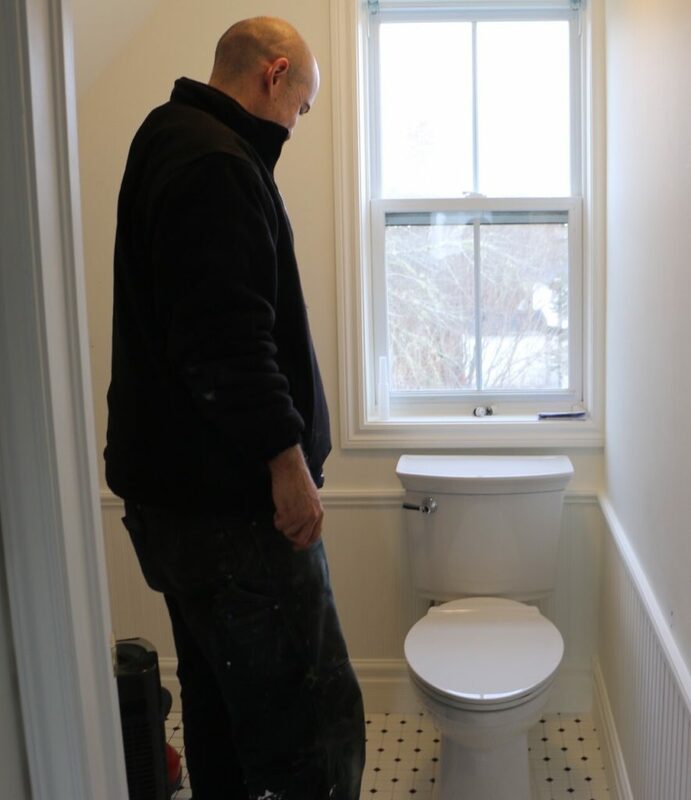 There have been other smaller improvements…water treatment system, storm doors (more nor’easter lessons) and a heat pump which we love! With R.E.D. securely resting in her new driveway spot for the winter, it was time to work on the Crow’s Nest. 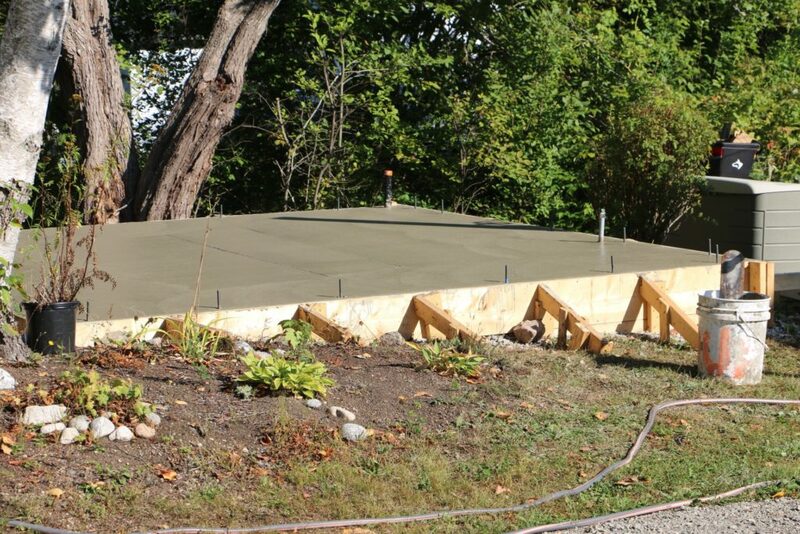 Look at that perfectly cured concrete pad just begging for the rest of the ‘he-she-storage-greenhouse-shed’. So here’s the story. One day after using the bath we noticed bubbling of the ceiling downstairs in the kitchen. Not a good sign and to add a little stress, it was just before guests from away were to arrive! So, fast forwarding to present time, it turned out there was a small leak in the bath’s hot and cold water lines. 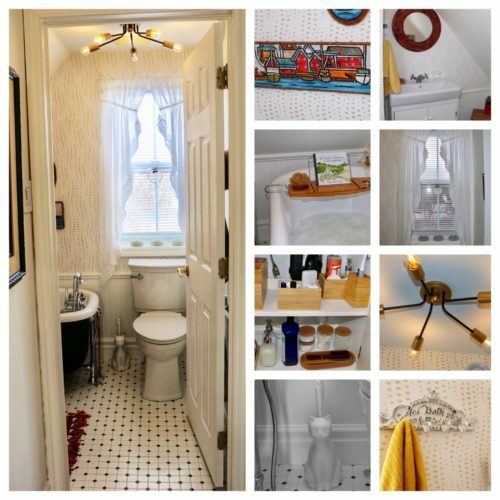 There were plans to make minor changes to the main bathroom anyway ….the toilet was old….and I had a few ideas decor-wise…you know, nothing major. 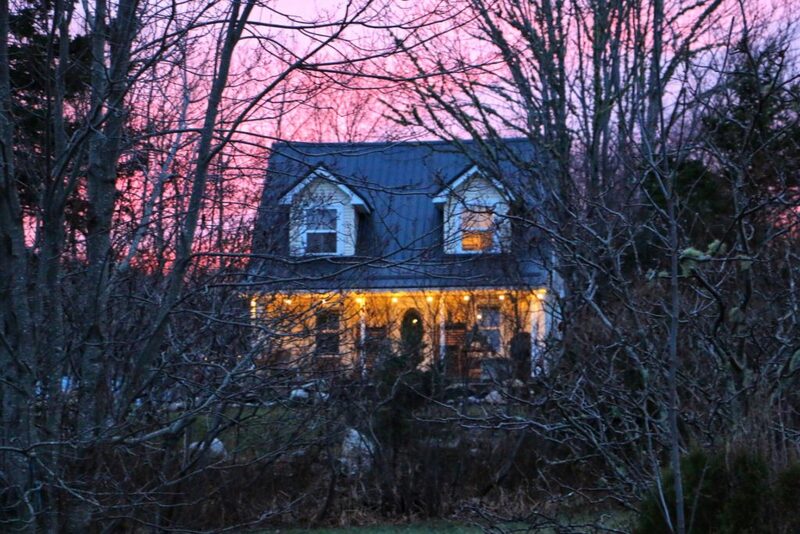 It was quite lovely as it was with that old country home kind of charm all of which I wanted to retain. Just add a little something more to make it ours. As I mentioned, there was nothing at all wrong with the bathroom design-wise. The fixtures kept with the loveliness of days gone by. 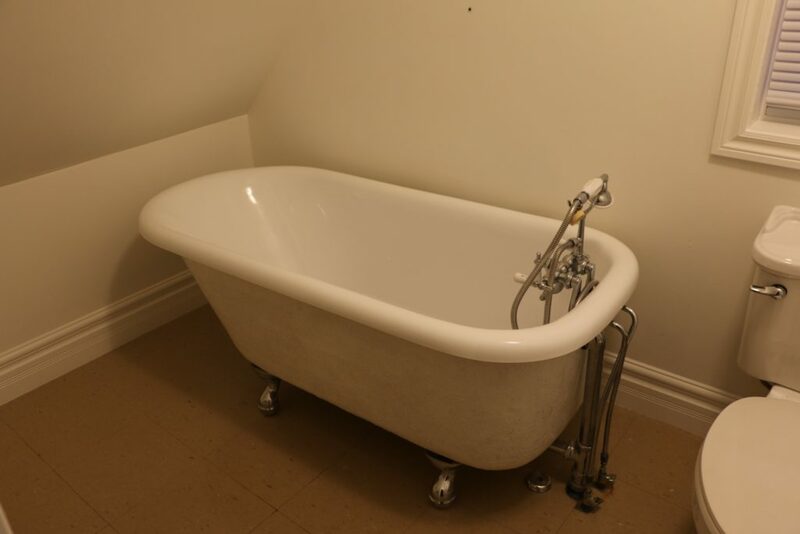 I love the claw foot tub with the chrome feet, and chrome and porcelain faucet/shower combination. 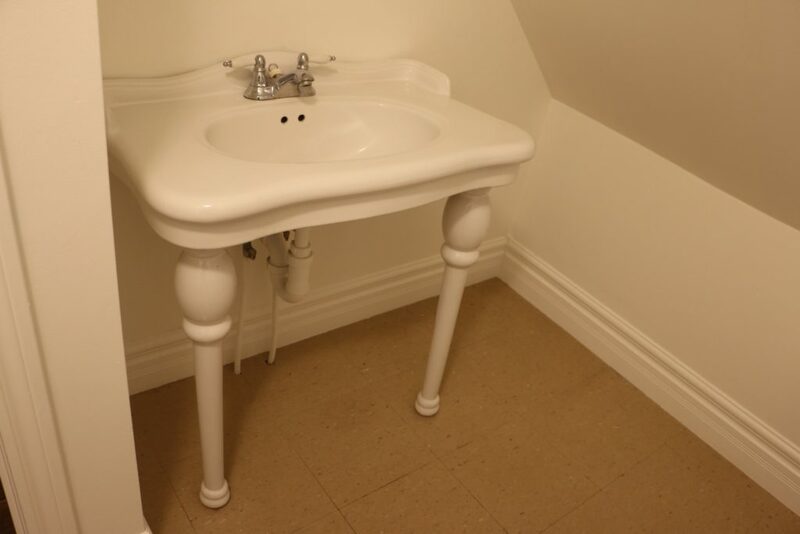 The console sink is a beauty too…maybe not the most practical but really pretty. The previous owner had such good taste. So that’s your tour of what was. Small….barely 8’ by 7’….and with the sloping gabled roof, it left precious little space for storage. We try to be minimal with our possessions but even minimalists have needs for the basic conveniences. 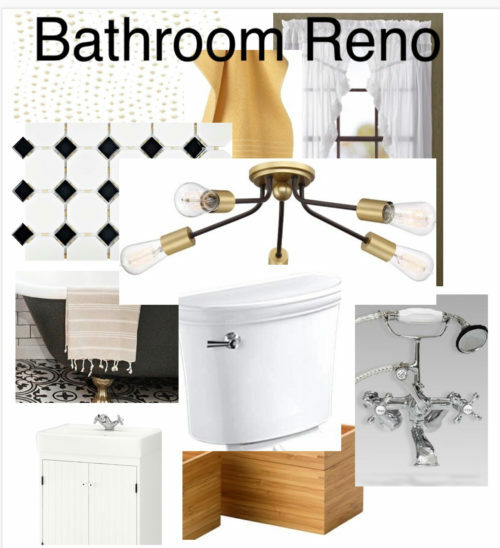 As with any reno project I’ve done, it’s fun to create a mood board which helps to bring concept ideas together while still allowing for flexability during the process. It’s a guide that also helps with budgeting. I was given a general dollar range and was determined to come within it. 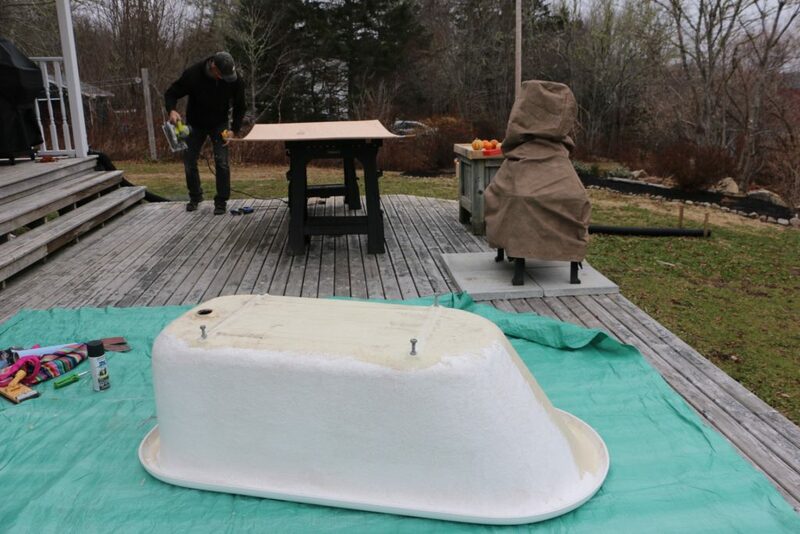 With the tub, sink and toilet extracted and resting happily outside in our yard (what will the neighbours think? ), Francois started removing the vinyl floor tiles. Forty-five minutes later, this was his progress…one tile. 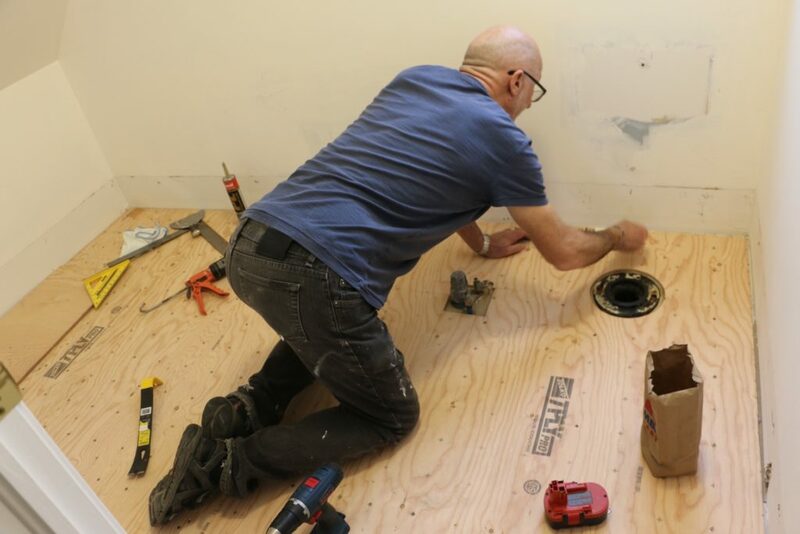 Oh, and I forgot to mention, the plumber was due in four days to install the toilet because we had another guest-visit for the weekend the following day and we needed to have at least the toilet part of the flooring done by then. 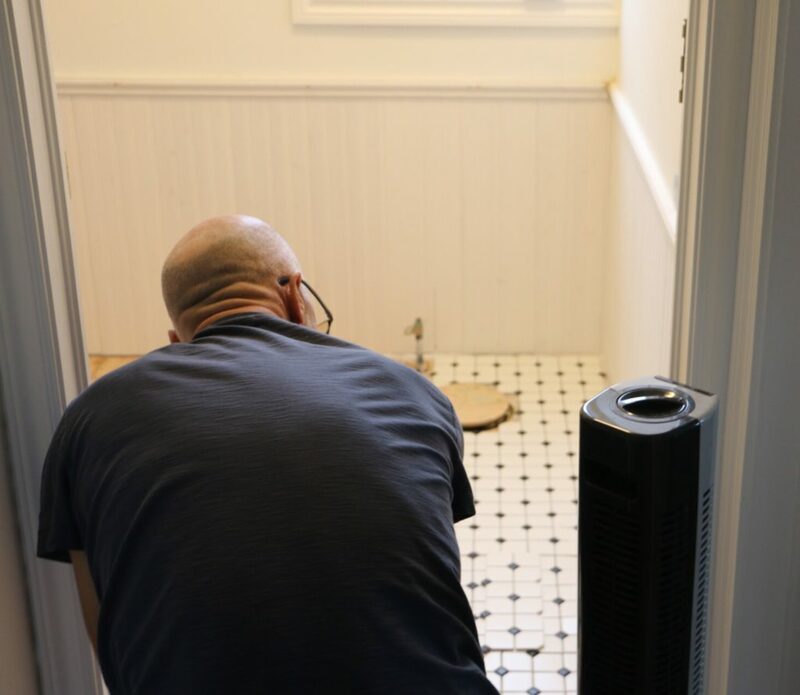 I called a friend who is a tile expert for some help and he gave us really good, time-saving advice. 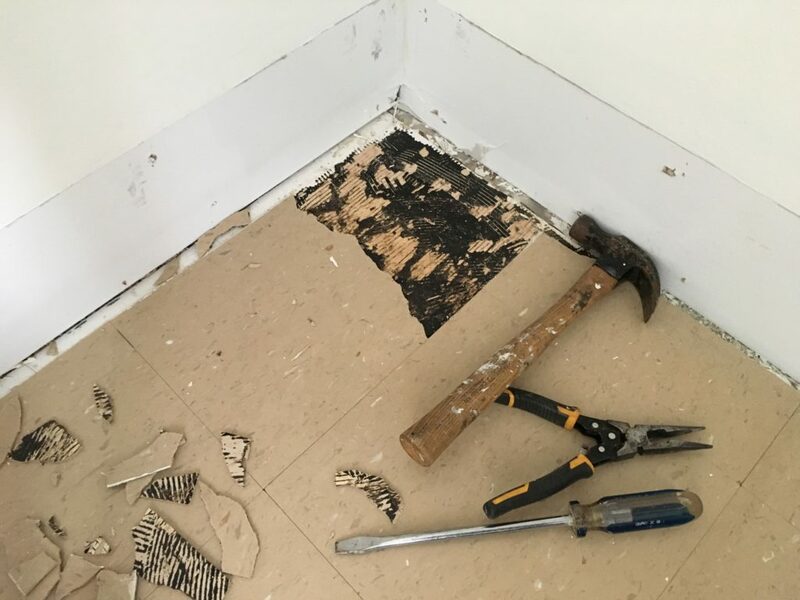 Leave the floor ‘as is’ and screw quarter-inch plywood on top for a solid substrate. Easy fix! Thanks so much Travis! 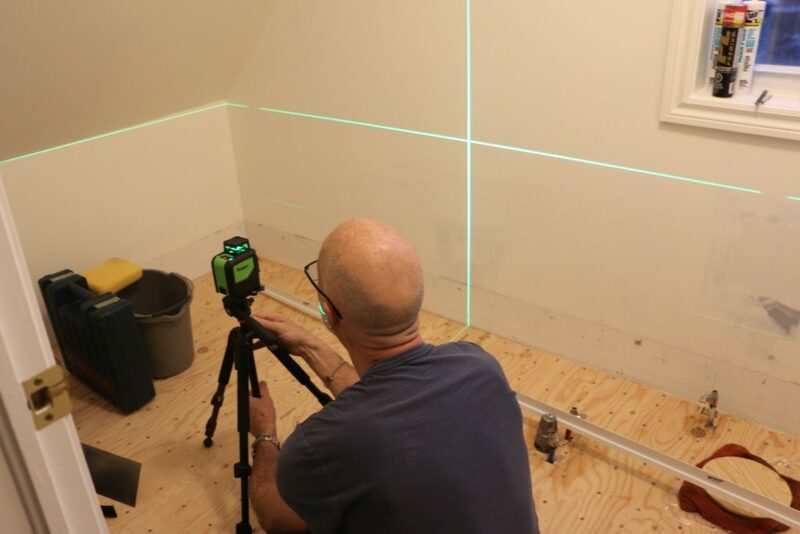 Nothing in an old house is square so trying to make everything level is tricky. The fun part (sarcasm) will be to make it appear straight. I have confidence in you Francois. Thankfully the weather has been typical-east-coast-mild so working outdoors has been possible. Dancing between bouts of rain was tricky but all the cutting is now complete. I’ve finished the tub painting…three coats of mat black was more than enough and it rested happily upside down in the middle of our living room waiting to be installed….the only logical place, don’t you think? There’s not much a little elbow grease and baking soda can’t clean. Just look at all of that sparkling shiny chrome, good as new! 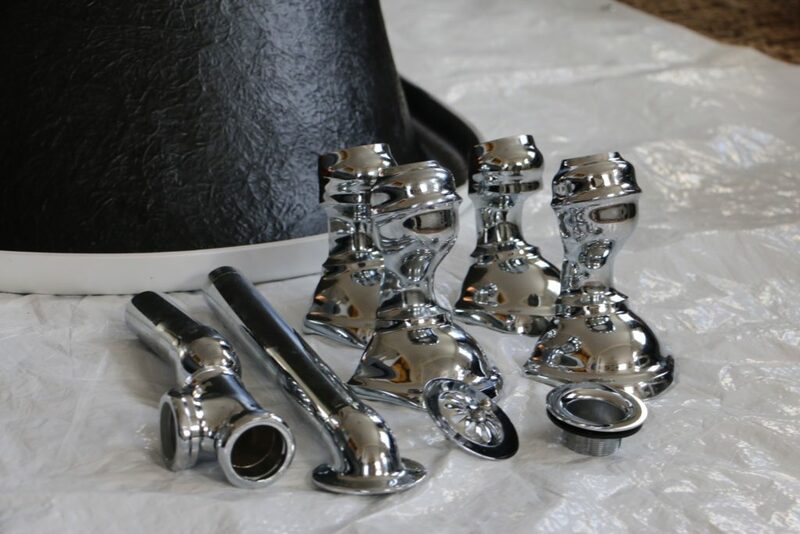 When the plumber dropped by to check on our progress he asked if we had bought new fittings. Insert proud Kat moment here. 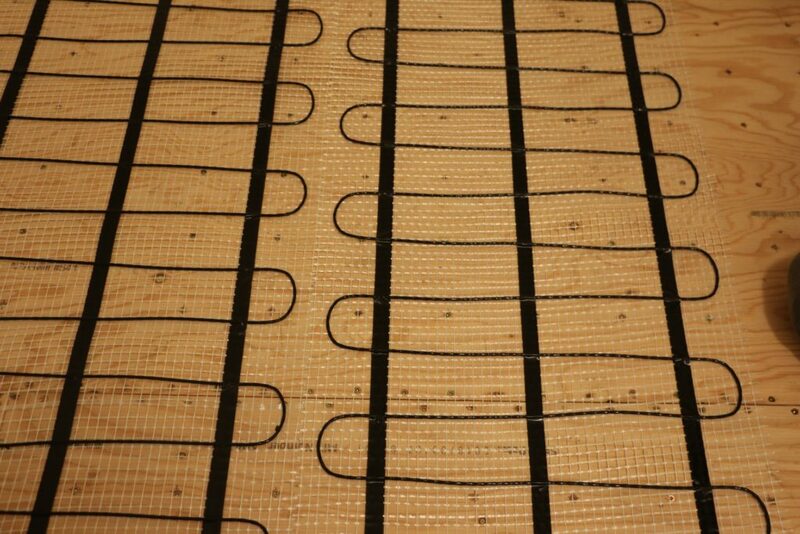 Back to the flooring story….yet another addition to ‘if we change the floor, we might as well… So the small baseboard radiator was removed and floor coils with thermostat installed for radiant heating. Another simple fix. Wainscotting was installed to add some texture so now to get on with flooring. 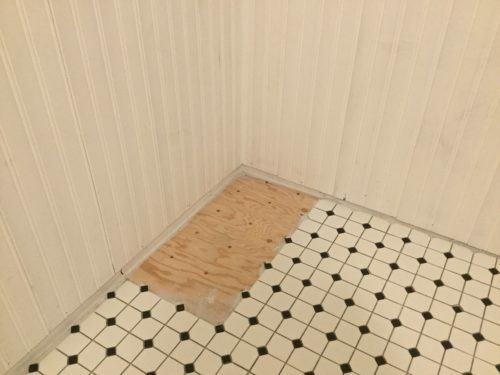 If time allowed it would be preferrable to finish the tiling and grouting, then replace the baseboard, then paint, but plumber day was fast approaching and we needed that toilet installed (at the very least) before the weekend guest arrived so just the toilet space was grouted for now. In the meantime my part of the project was on hold. With such a small space in which to work, if the two of us were in there together, probably only one of us would come out alive…so I handed things, unpacked things, made countless trips to the hardware store for supplies, shopped for accessories and, the hardest part for me otherwise was to stay out of the way. Oh, and I assembled the new vanity. Let’s hear it for more storage! 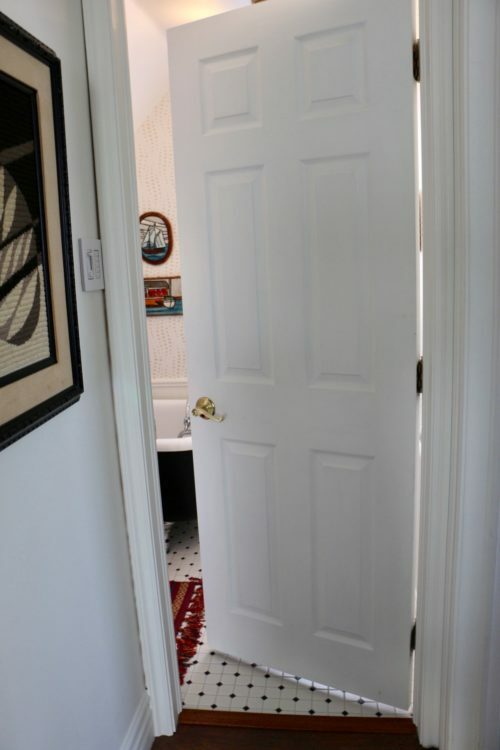 Dan the Plumber did such a good job! Just showing up gave him a five star rating in my books and he more than exceded our expectations. Great communicator, great service, creative and really nice all in one package. Now on to more flooring. I found the perfect tiles for this space a couple of months ago but when we decided to purchase, there was a lady who was there ahead of us buying up what we thought was the last in stock. The tile guy told us to wait and he would see if he could get us more. Thankfully he did and we cleaned the store out of all they had hoping it would be enough. Imagine that wee moment of panic when the flooring was almost finished and we realized we were two square feet short. So I quickly went online and found two more. Whew! Disaster averted! Many years ago, Francois asked me to put together a concept for our condo bathroom…a spa experience, like a boutique hotel he said. In spite of its small size it turned out to be a little haven with deep soaking tub, rain shower, white fluffy bath towels hanging on their heated towel rail. The minimal with a blend of the new……and the old…the just enough space for essentials..
…the local art with a little seaside charm thrown into the mix. It all makes me smile. And when I fill up that pretty bathtub with lavender bubbles, put on some of my favourite tunes, pour a frosty martini and step in, I smile. 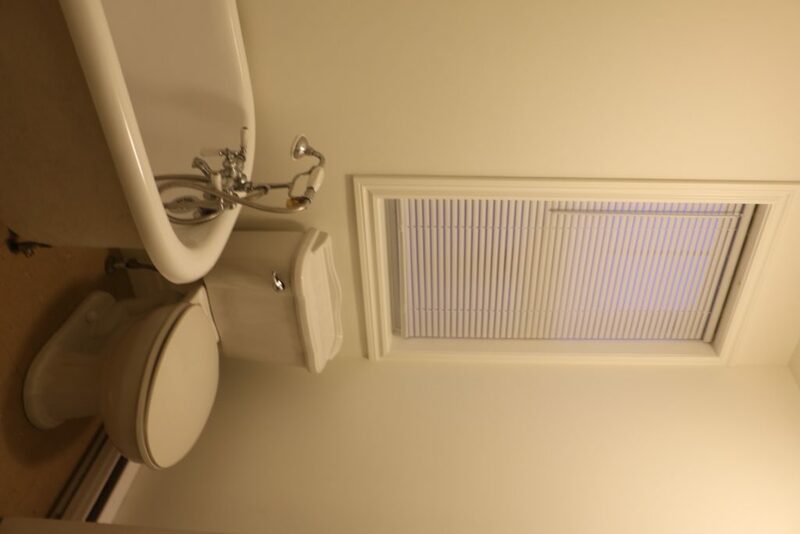 This little, rather ordinary bathroom is no longer just functional. It has become a retreat. 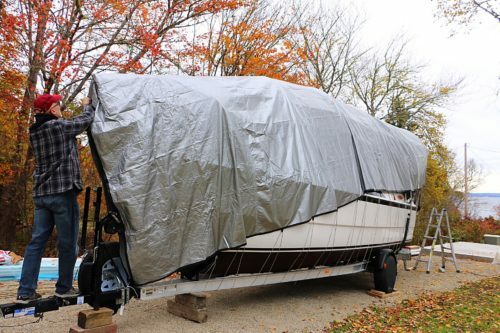 And as with any of our renovation projects…condo…even on the boat…we add a little something of ourselves, a symbol of successful team work and love, hidden for any future owners to find. So before closing the wall, Francois left his mark. There you have it. One project completed. When you think of it, this had all the elements of building a house…flooring, drywalling, electrical, plumbing, decorating…of course on a small scale…but still. We planned it so that we would still be happy with the look several years down the road…maybe forever. And on final calculations I was way under budget. …no spoiler alert from this Galley Kat…. Thanks for dropping by. You can always count on us to have something new coming down the road. Bravo! Nice reno. U have a beautiful house with lots of charm.